Decadent, delicious and very moreish. You'll love these unique brownies! Preheat the oven to 180°C / 350°F / gas 4. Prepare your lined tin - I use a 20.5 x 30.5cm one. For the dark chocolate batter place the butter in a heatproof bowl along with the dark chocolate. Put a small amount of boiling water into a saucepan and rest the heatproof bowl with the butter and chocolate on top, then melt the contents on a low heat. You don't want the water to boil. Once melted set aside. Add the sugar and eggs to your electric mixer then whisk for about two minutes until your mixture is slightly frothy. Pour the chocolate mixture into the bowl and whisk in for a few minutes until all of your mixture is all combined. Sift the flour and cocoa powder into your mixture and stir with a wooden spoon until all combined. Add your mixture to your prepared tin, pouring in evenly. Gently bang the tin on the work surface to get rid of any air bubbles. Repeat steps 2-5 using your white chocolate ingredients, but remember to NOT add cocoa powder. When your which chocolate mixture is ready pour it on top of the dark mixture, scattering it as you do to make a marble effect. Then use a sharp knife running along your mixture to make more marbling. Bang once again on the work surface to get rid of any air bubbles. Place the 35 raspberries evenly over the mixture. Carefully place them in the oven for 20 minutes. To test the brownies are cooked put a metal skewer in and it should come out clean. 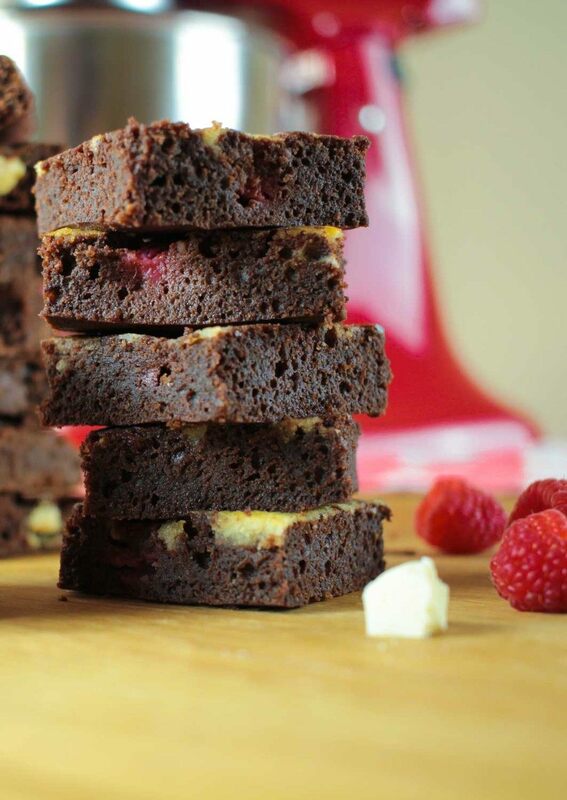 Leave the brownies to cool before cutting up in to squares. Simply have them on their own or with an afternoon cup of coffee. Enjoy!